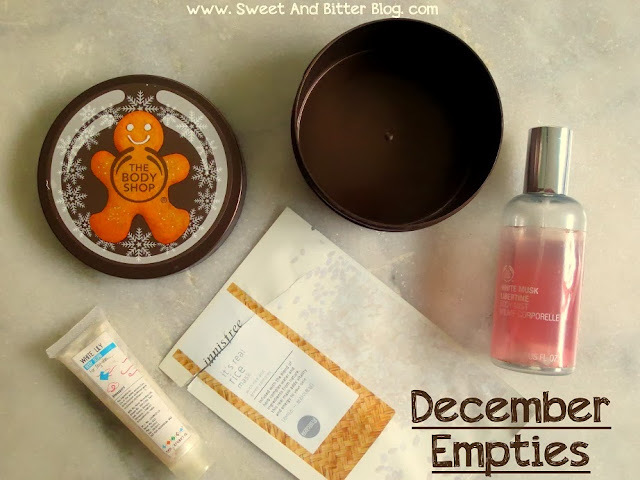 Last Empties Post of the Year 2013! Looking back at the year (no, I am not going to count on how good or bad it was because it is all mixed up for me! ), the best decision was to start doing Empties Post from May. I had loads of product which I had for years which I was not ready to throw away and saving few drops in each. But, when I started doing Empties Post, I used those last few drops and throw away the bottles which I could not re-use. My bathroom shelves have loads of space now. All thanks to you! This month I finished The Body Shop Ginger Sparkle Body Butter, The Body Shop White Musk Mist which always stayed in my makeup bag, Nature's Co White Lily Scrub that came in Nature's Co Beauty Wish box and used one of the Sheet Mask from Innisfree. I am going to use that tub for something. Don't know what I will do as I keep on saving the Body Shop Butter Tubs with are no use. PS: Two winner for 2nd Anniversary Giveaway are to be declared and another giveaway is about to start..
Innisfree Haul with Santa's Gifts! MERRY CHRISTMAS from Sweet And Bitter Blog!